Over the years our engineers have come up with some very good ideas for cabinet locking systems and this 1121 cam ramp is a lovely installation detail which adds to the quality and feel of standard lock installations with metal cams, as used in electrical/electronic enclosures and cabinets. The moulded ramp is self-adhesive and easily fitted to protect the painted surface of the cabinet where it offers smooth gliding properties and enhanced gasket pull-down as well as a centre index feature which improves the positive location of the cam in its locked position and provides a measure of vibration resistance. 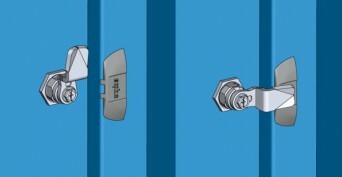 Share the post "1121 Lock Cam Ramp"